New year’s eve is just around the corner, people are counting backwards the hours left, running to buy last minute gifts, the atmosphere is festive, children are happy cause of the snow, everyone is tightening their scarves, some hate Christmas and stay at home, others enjoy the holiday spirit, these magical days, the hugs, the kisses, the family meals which we love to hate, the same discussions, the usual fights, feeling impatient to meet with friends for a coffee and grumble about that uncle who always makes you angry, laughing, pondering upon the year that comes to an end, to remember, to forget and -even if you though you hated these days- to put a smile on that face just before you close your eyes sleeping wrapped up like a burrito under the covers. New year’s eve is just around the corner, but people in the camps have it differently. The cold there is more bitter, the rain passes through the tents, everyone is piled up on each other, without a roof over their heads, children get sick, medicines are not enough, sleeping at night becomes a challenge, garbage stay there for days, there are only a few coupons for food, pregnant women are malnourished and often give birth on their own, the quarrels and differences multiply, problems increase, patience and strength diminish, conditions worsen, the borders remain closed, racist violence attacks become more and more, the media broadcasts fewer and fewer truths, people stop paying attention, people forget. But the kids there are always laughing. 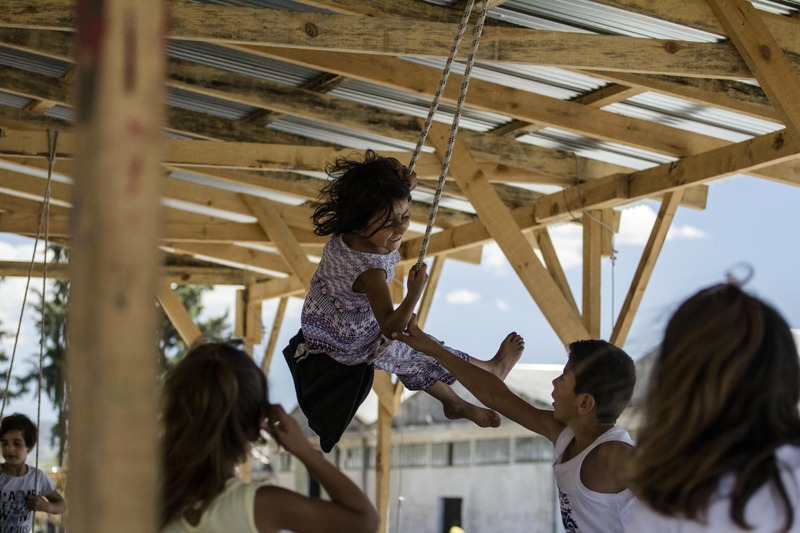 They are playing non-stop, running up and down all day, people inside the camps are handing out smiles, women knit, they take care of the little ones, families acquire their daily lives, things go on with hope and gratitude for the few things they have. That’s when you wonder about the power of man to withstand hardship, having left his house, his job, his family, his prestige and dignity to begin a journey of no return, without perhaps even a destination, with huge doubts about survival, dealing with incredible difficulties and problems, dealing with hatred, racism and xenophobia. And apart from all that, having the courage to continue fighting for the things he deserves, fighting with no pause for a better future, claiming equality for himself and his children. That’s when you wonder also about the power of man to humiliate his fellow man, to hate someone because he fears diversity, turning his gaze in order not to see, not understanding that tomorrow he might find himself in the same situation, it might become necessary to break himself into a thousand pieces in order to cope and survive. How can a man believe that someone is inferior than him, how can he stare into the eyes of another and do not see his own self? How is it possible in -almost- 2017 to still have to write and say things that should be known and understood by the collective unconscious and imprinted deep in the hearts and minds of all mankind? January 1, 2017 in only a few hours. Let’s put first in our new year’s resolution list to become more Human before aiming to get anything else.